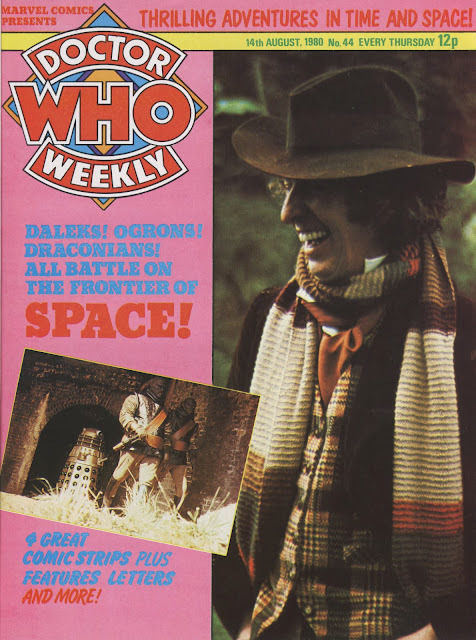 It's the issue of DOCTOR WHO WEEKLY that never was. By the summer of 1980, MARVEL UK's new launch was struggling. It's creator, Dez Skinn, had departed the Annex of Ideas 'by mutual consent', depriving it of its principle champion. A relaunch chasing younger readers had proven a misfire, sales were down because of the long break between TV seasons and the high costs of origination and licensing hard for a reprint-operation geared to exploiting its own royalty-free strips to stomach. The writing was on-the-Tardis-door when Marvel management, in a last gasp to keep things afloat, cut the frequency to monthly. 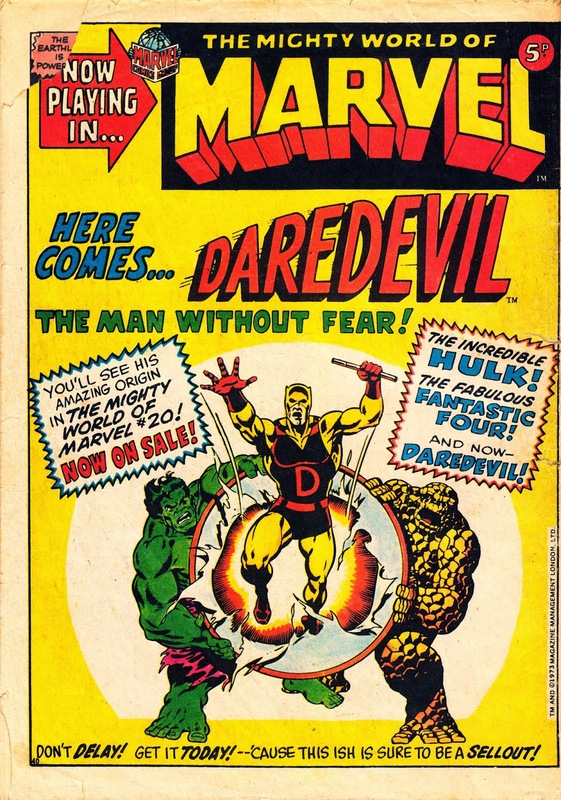 That instantly made each issue more profitable, kept copies on sale much longer and approximately halved the amount of new material required each month. A cut in frequency is usually a sure sign of approaching armageddon with a succession of titles having their frequency snipped just before being cancelled. M-UK pulled the same trick with THE EMPIRE STRIKES BACK a few months later (the first monthly issue was cover-dated November 1980) although that decision may have been motivated by the reliable supply of new material shipped from the States rather than a calamitous circulation collapse so soon after the release of the second movie. It's replacement on the weekly schedule, FUTURE TENSE, barely lasted six months before being relaunched as monthly. It was cancelled six issues later. More recently (but, scarily, not recent at all), OVERKILL was cut to a monthly schedule in late 1993 (issue 43), only to succumb to the fallout of the GENESIS IMPLOSION less than a year later. 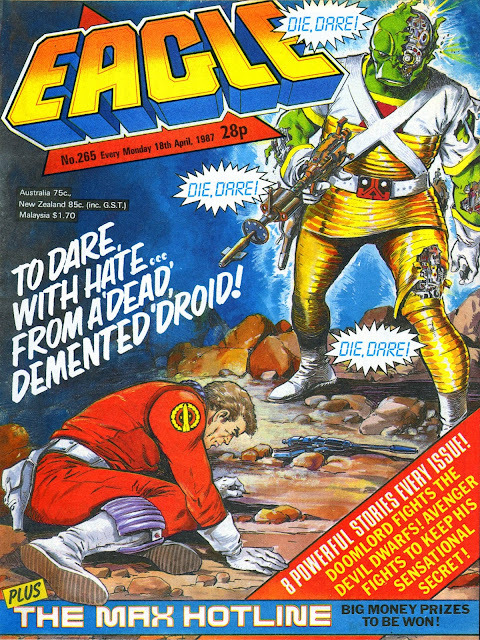 Over at IPC/ Fleetway, the EAGLE soldiered on as a mostly-reprint monthly (effectively replacing the defunct BEST OF EAGLE MONTHLY which failed to set any sales records) as last-man-standing (outside the 2000AD) in the Boys Adventure portfolio. 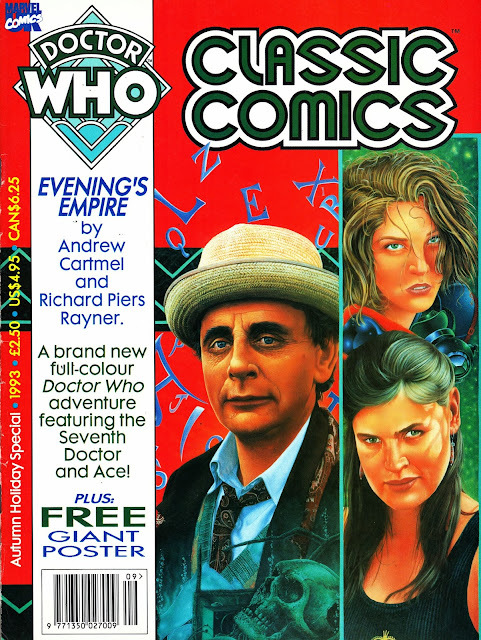 This cover appeared in the 1989 10th anniversary special (see previous post) and I assume it's authentic rather than some novelty after-the-event flight of fancy by Marvel's design boffins. If it is the real deal, it's probably a good indication of how late in the day the decision was made to relaunch. Or, how far ahead, the covers had to be designed. And, maybe it's just me, but its crazy combination of eye-catching covers seem prescient of Colin Baker's costume. 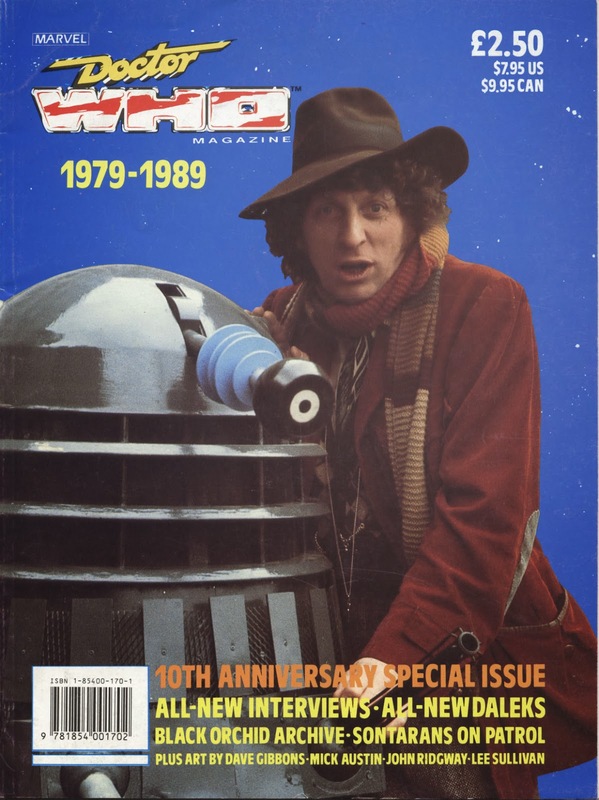 The 1989 DOCTOR WHO SUMMER SPECIAL was another excuse for a celebration: 10 years of MARVEL UK's DOCTOR WHO MAGAZINE, nee Monthly and Weekly. Although, the bulk of the articles were tenuously connected at best. It was another square bound, album-format edition with an overview of the title's history, interviews with Nicolas Courtney, Colin Baker and behind-the-scenes bod Tim Coombe, Black Orchid in the Archive, a 'creature feature' on the spud-headed Sontarans, a piece on K-9 and a great redesign for the Daleks by their original BBC in-house mastermind Raymond Cusick. 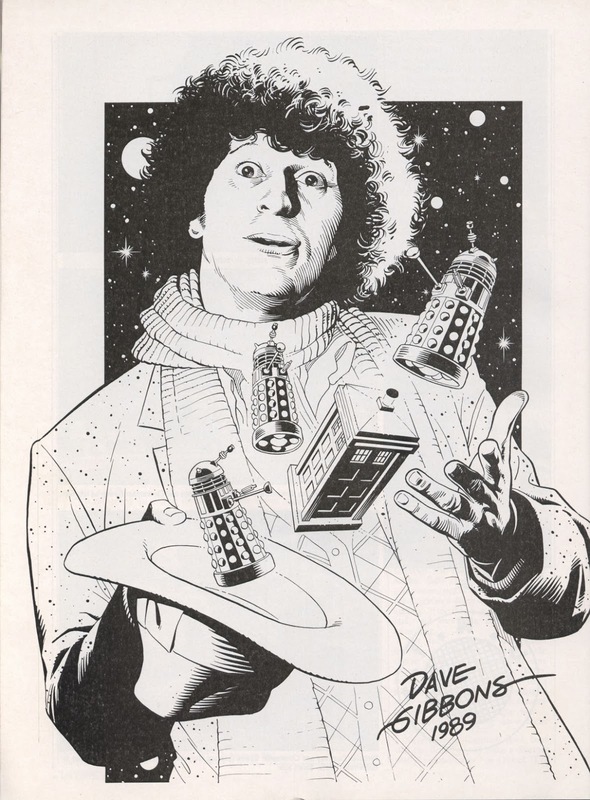 The issue also featured a portfolio of artwork from past contributors to the comic strip and the cover for the unpublished 44th issue of DWW. I'll post those separately. 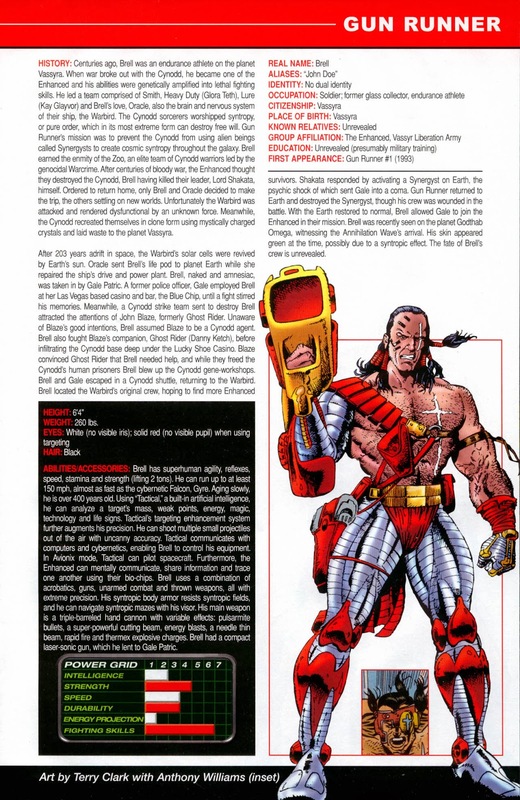 A dose of early nineties big gun silliness today: GUN RUNNER from MARVEL UK's GENESIS 92 sub-universe of books. 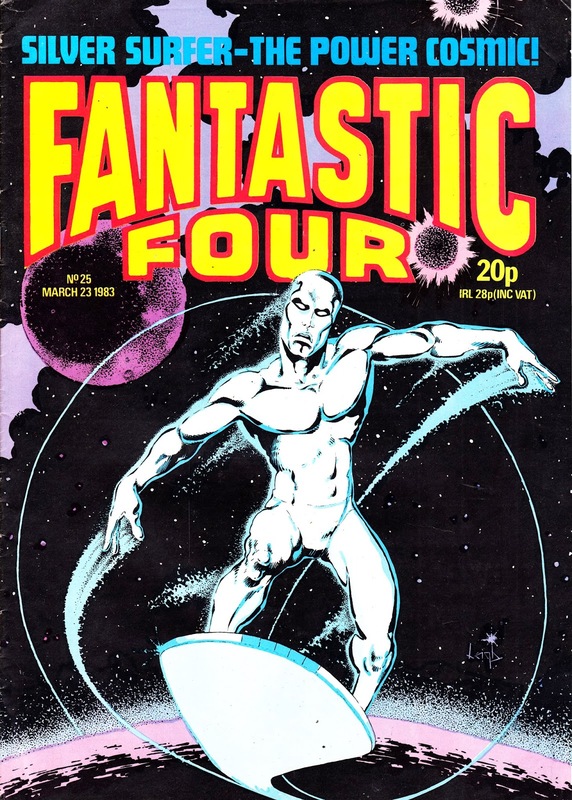 His book debuted towards the end of the Genesis Explosion, cover-dated October 1993 and shuttered six issues later (cover-dated March 1994) as one of the final casualties of the Implosion. It's amazing what you can find out by reading THE METRO on the way to work. Browsing London's free morning paper today I discovered that this very weekend Hammersmith's Riverside Studios (not a million miles from my abode) is hosting the annual TWIN PEAKS UK FESTIVAL. Who would have known such a thing even existed? Not me! It's sold out so obviously everyone else knew. But, it's given me the ideal excuse to run this cover… the first issue (first printing!) of WRAPPED IN PLASTIC, the TWIN PEAKS fanzine that ultimately clocked-up a highly creditable (nigh on amazing) run of 75 issues between October 1992 and September 2005. Not bad for a TV show that briefly burned brightly, withered quickly and only lasted 1.5 seasons (the first is short, the second was a full run). I used to buy this magazine religiously but eventually drifted away (or it got hard to find) somewhere towards the end. It launched as a TP zine but quickly broadened its horizons to cover the entire David Lynch catalogue, other shows in a similar vein (EERIE INDIANA, PICKET FENCES) and other projects from the show's cast and crew. It was WiP that first spotted the potential of THE X-FILES and championed it before the rest of the world's media even seemed to notice it existed. WiP in turn spun off SPECTRUM which had a broader remit and devoted the same in-depth coverage and analysis to LOIS AND CLARK, BUFFY, ANGEL, ALIAS, SMALLVILLE, XENA, ROSWELL, KUNG FU: THE LEGEND CONTINUES, M.A.N.T.I.S, HOMICIDE: LIFE ON THE STREETS and other contemporary shows of similar quality and integrity. Heck, they even printed a couple of emails from me! 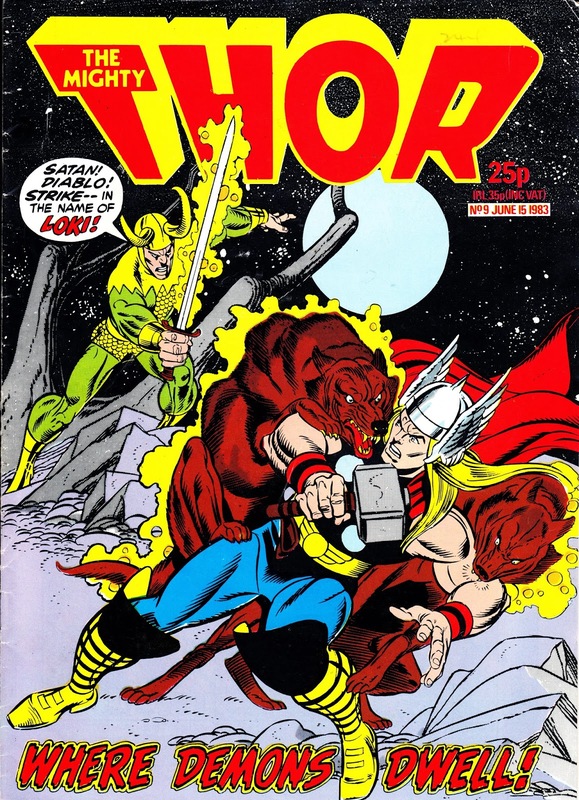 This first issue was pretty hard to find at the time (and I don't think I ever saw copies of the second and third issues on sale in the UK) and sold-out fast. A second printing had a colour illustration of Laura. Wrapped in Plastic, of course, referred to how Laura's body was discovered in the TP pilot. I'm struggling to recall now but I have a vague idea that this first issue did indeed come bagged. 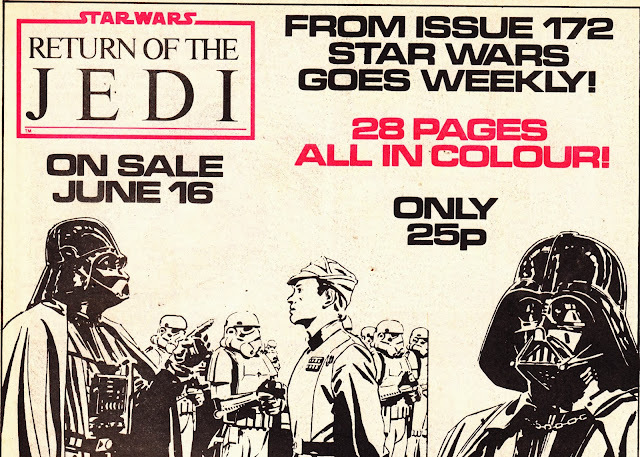 This is an interesting MARVEL UK House Ad, from 1 June 1983, plugging the about-to-launch RETURN OF THE JEDI weekly. 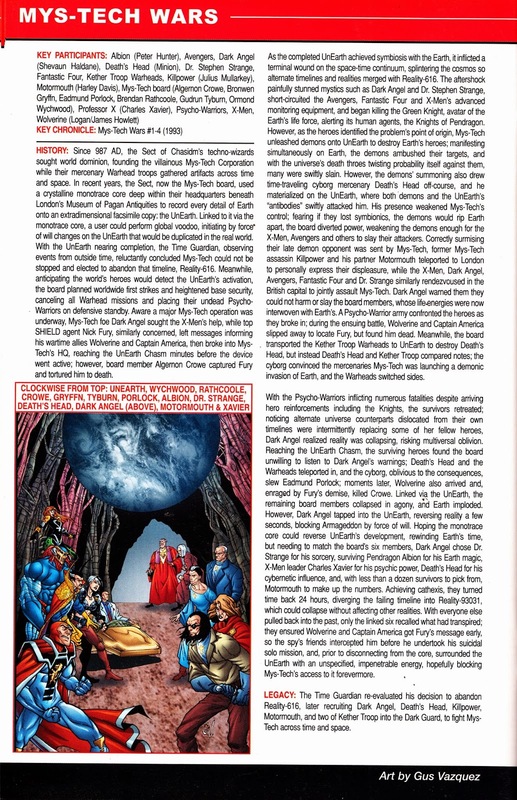 Because it implies that the original plan was to continue the ongoing numbering from the final issue of the STAR WARS MONTHLY which, despite four title changes (STAR WARS WEEKLY, THE EMPIRE STRIKES BACK WEEKLY, THE EMPIRE STRIKES BACK MONTHLY and STAR WARS MONTHLY) and a frequency change (from weekly to monthly) dated back to the launch of the British comic in February 1978. ROTJ eventually appeared with a brand new first issue… and clocked-up 155 more issues before succumbing to saga apathy (and Marvel NY abandoning the license) three years later. It's an odd selection of art (from the official adaptation) as well. Darth's definitely the iconic image but waggling his finger at a lackey is hardly the most dramatic moment in the movie. Maybe all the good stuff was embargoed! 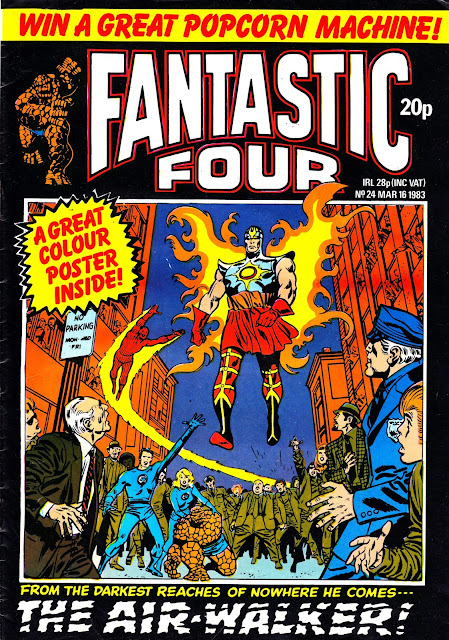 As I posted previously, MARVEL UK's first forays into colour printing (since the original CAPTAIN BRITAIN anyway) were a bit of a disaster. 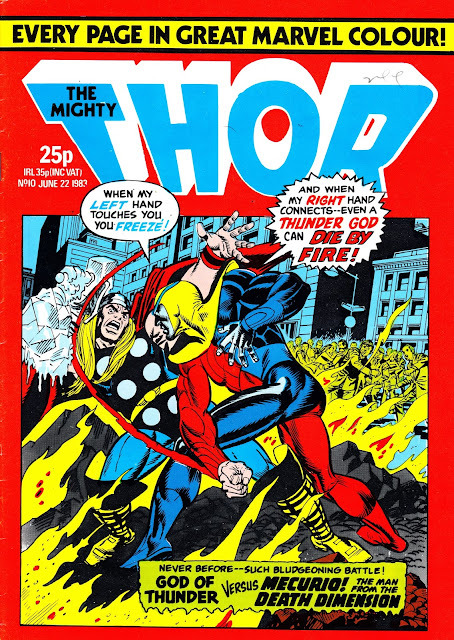 The first issue, THE MIGHTY THOR 1, wasn't bad but - a week later - the quality control nosedived and subsequent issues, and the early issues of THE X-MEN and THE MIGHTY WORLD OF MARVEL monthly, were rendered all but unreadable by the debacle. 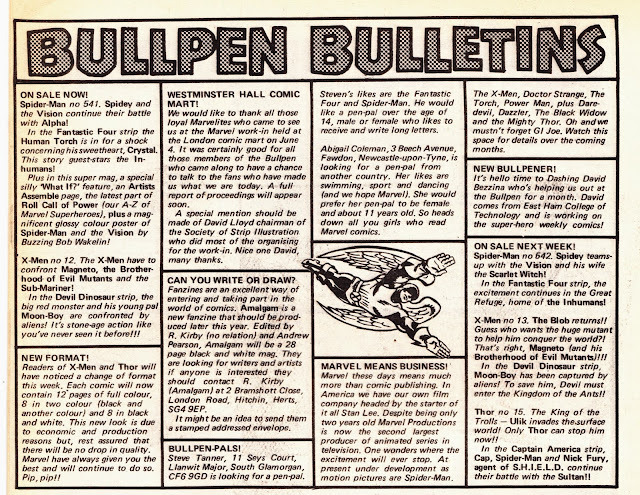 Here are three clippings, all from THOR, where the British Bullpen apologised, explained and - eventually - 'fixed' the problem by - errr - drastically cutting the colour pagination each issue (down to only 12 pages). 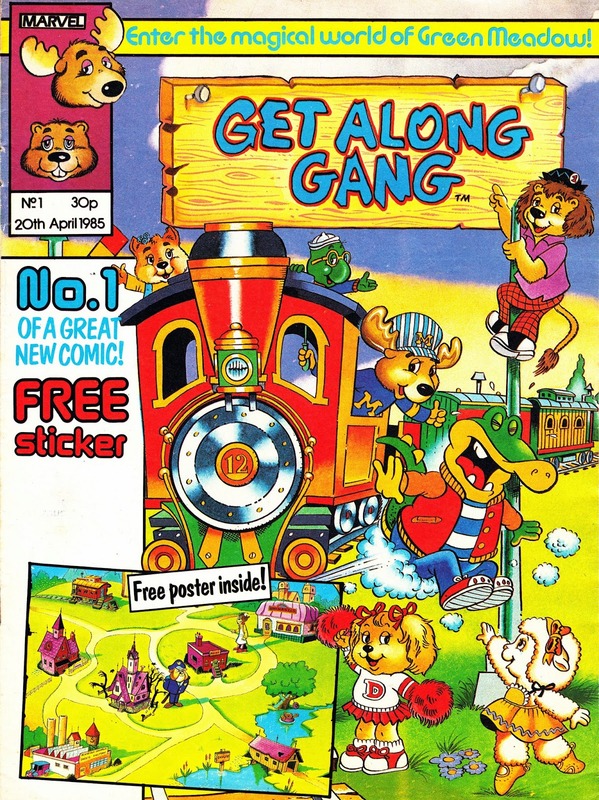 They only really cracked it in 1985 when they introduced the full-colour, glossy 24-page format with THE GET ALONG GANG 1. It's worth noting that M-UK were still light years ahead of the competition who were still churning out the cheapest possible comics on antiquated presses. 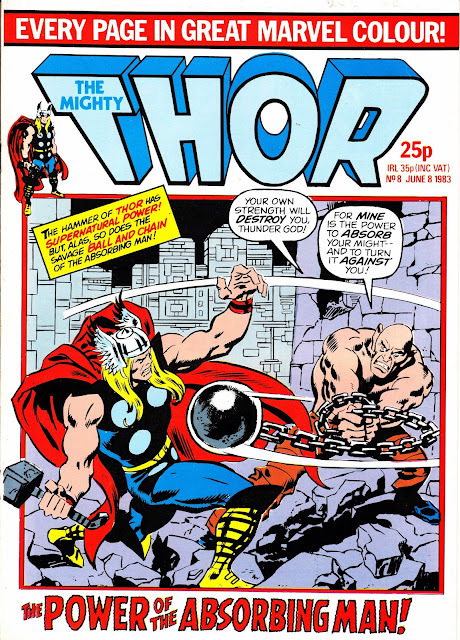 I'm not sure how I managed it but I seem to have neglected to post any THE MIGHTY THOR covers for a while, sorry about that! Here's a Cover Gallery from June 1983, covering (ahem) issues 7-11 of the MARVEL UK weekly. The 11th issue is interesting as it added Captain America to the line-up. That's a reversal of the last months of Cap's own weekly which featured the Thunder God as the supporting feature and - judging by the number of times he hogged the cover - was being tested to see if he could support his own book. It's the battle of the STAR WARS wannabes. 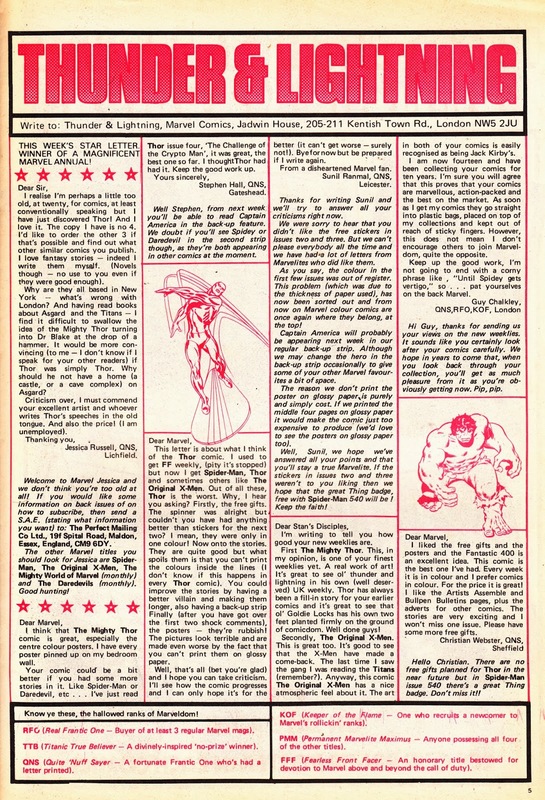 This is an ad, published in US comics dated April 1980, plugging the action figure lines from the two Christmas 1979 would-be SF blockbusters THE BLACK HOLE and STAR TREK THE MOTION PICTURE. Both lines, scaled to Kenner's Star Wars figures, came from MEGO in their unsuccessful attempt to make amends for not snapping-up the Lucas license (they also took a punt on BUCK ROGERS IN THE 25th CENTURY and - err - THE DUKES OF HAZZARD) but neither line proved very successful. 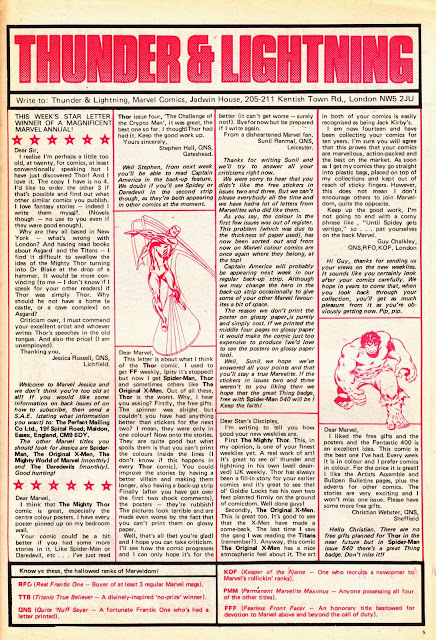 According to the Mego multi-part history published in Tomart's toy magazine, The Black Hole license proved a major stinker for the company (which is a shame as the figures were really rather nicely made) but they recouped some of the dollars they'd lost by striking a deal with Disney over the TRON name, trademarked by the toy maker through the MICRONAUTS line. 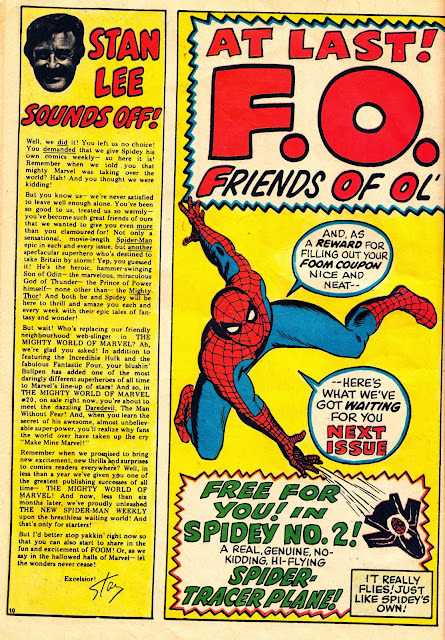 The HEROES WORLD name would loom large in the future history of US comics. That was the retailer Marvel rashly snapped-up in December 1994 (the company was originally spun-off from Marvel's own mail order business in the mid-seventies) with grandiose plans of upgrading the local retailer and distributor into Marvel's exclusive in-house distribution business. That sparked the dash-for-exclusivity that saw other publishers rush to sign their own deals. The fallout left Diamond Distributors, alongside Heroes World, as last-man-standing. HW proved a stinker and was eventually closed in 1997 as Marvel struggled with bankruptcy. With no other options available, Marvel were forced to go cap-in-hand back to Diamond. Whoops. MARVEL UK diligently celebrated WHO's 25th anniversary, even as the BBC were doing their best to knife it, with another square bound album-format special edition. 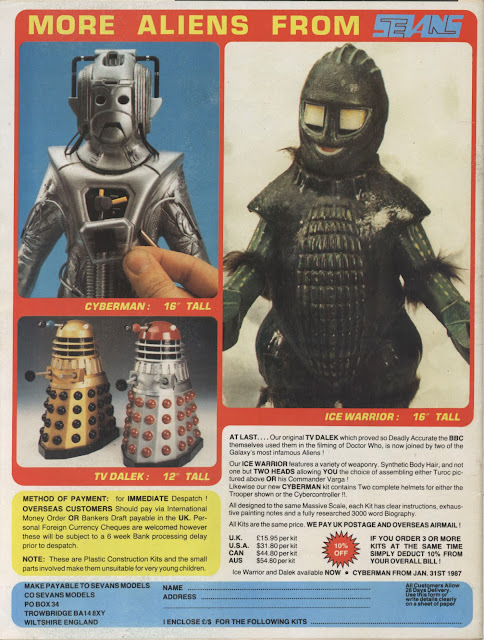 The contents included brief overviews of the Docs-to-date, a skim through books, comics and merchandise, pieces on effects and horror and a new (uncredited?) text story (cheaper than a comic strip!). This is a Blast-from-the-MARVEL UK-past which, at first glance, probably wouldn't be deemed worthy of interest to many fans. 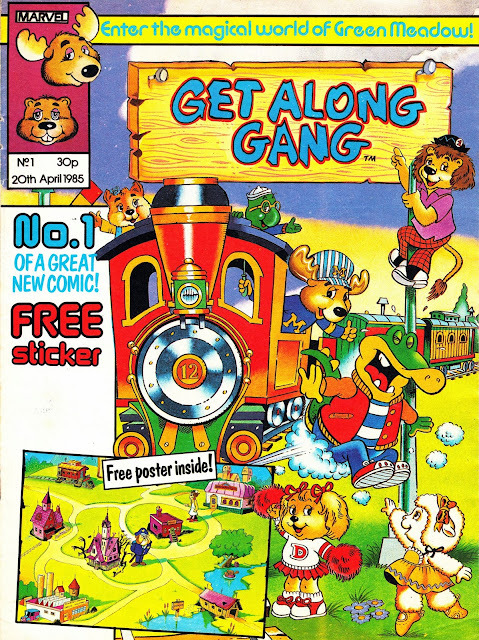 The first issue of the GET ALONG GANG weekly was the first M-UK comic to introduce the 24-page, full-colour glossy format that became the standard for the weeklies and fortnightlies over the next few years. Marvel had been experimenting with colour interiors, with varying degrees of success, since the painful launch of THOR and X-MEN in 1983 but all their previous attempts all relied on a mix of colour and black & white pages, occasionally recreating the sensation of watching a TV about to die. GAG (hmm!) was the first to crack all-colour interiors on a regular basis (THE TRANSFORMERS issue 1 was full-colour… but that was a one-off lure that didn't last). 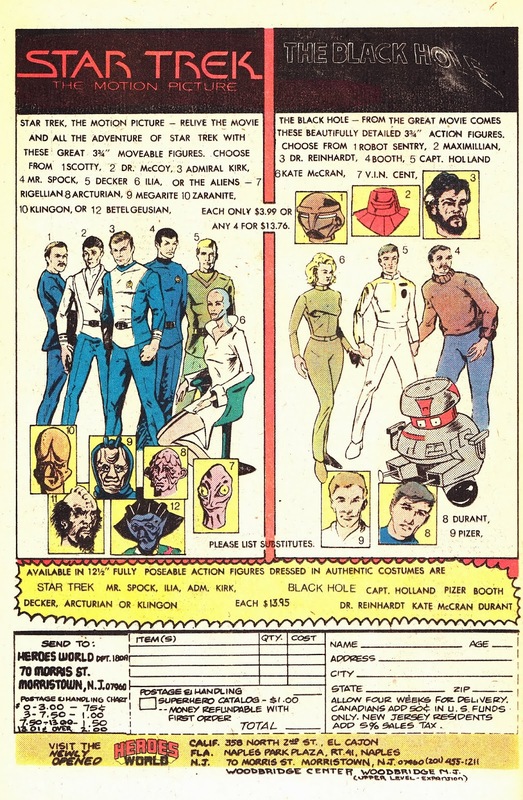 The Robots in Disguise switched from issue 27 (cover-dated 21 September 1985), followed by RETURN OF THE JEDI (26 October 1985) and SECRET WARS from issue 19 (9 November). SPIDER-MAN AND ZOIDS adopted it from launch (8 March 1986), as did ACTION FORCE (7 March 1987), THUNDERCATS (21 March 1987) and THE REAL GHOSTBUSTERS (26 March 1988). New additions to the range for younger readers, including THE CARE BEARS, MUPPET BABIES and ACORN GREEN all followed the same formula. 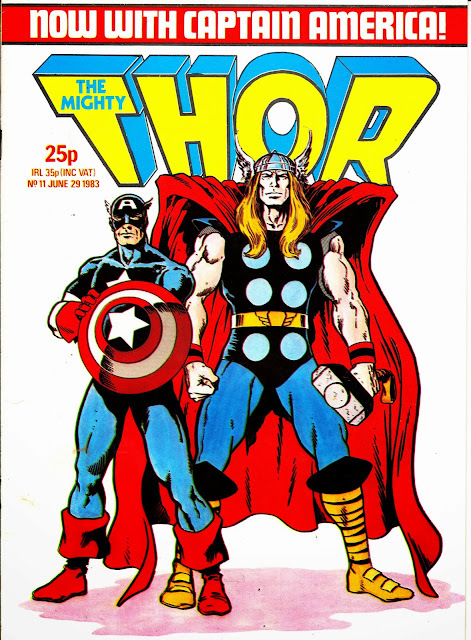 The comic itself was based on the US syndicated animated show which, as was the eighties way, expanded out to encompass all possible licensing opportunities. The gist of the cartoon was that friendship and co-operation (some would say conformity) was the key to a better world, all delivered in a heavy-handed kid-friendly pro-social way. The show itself formed part of TV-am's weekend line-up, the theme tune ("Get up with the Get Along Gang") being an absolute gift to the breakfast broadcaster (who was seldom averse to running merchandising-flogging animation unless chastised by the IBA). For what it is, it isn't bad but it seems to have escaped the DVD era entirely. Marvel US picked-up the GAG license and published a mere six issues under the just-created Star Comics brand. 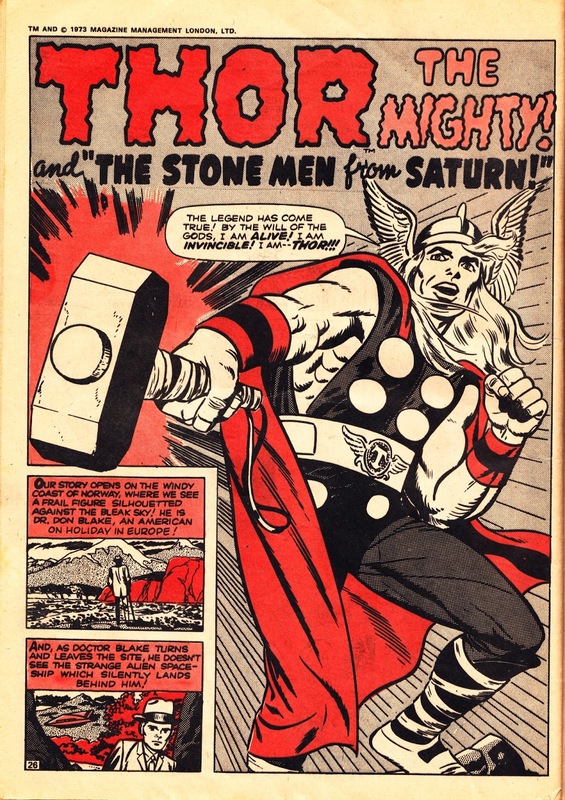 Those six outings crossed the Atlantic and appeared in the UK edition but, with such poor pickings, the bulk of the British editions contained new strips from British creators. The first back-up strip was Top Dog, also from the Star line. The British edition ran for a highly creditable 93 issues through to early 1987 and also spun-off Collected Comics specials (from Winter 1985), annuals and other sundries. 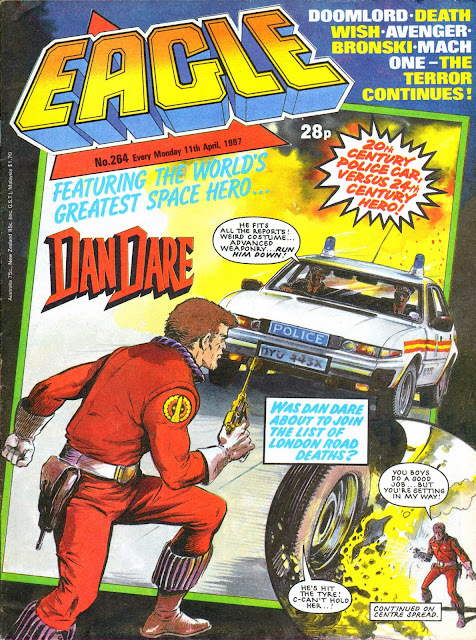 Here's another four Dan-tastic editions of the EAGLE, all with April 1987 cover dates. They appear, once again, courtesy of the generosity of g23. It's the morning after the night before… DOCTOR WHO's 50th anniversary has come and gone… but STARLOGGED is continuing the celebrations. This post will need no introduction to connoisseurs of British humour comics: OINK emerged from the IPC stable (albeit produced and packaged far away from King's Reach Tower) like (ironically) a breath of fresh air in May 1986. The piggy-themed fortnightly (then weekly and - finally - as a kiss-of-death monthly) soon adopted a formula of following a different theme each issue. This, the 24th outing (25 if you count the freebie preview issue bundled with the existing IPC weeklies), was designated the Time-Travel Special and - inevitably - WHO was one of the targets. It was cover-dated 21 March 1987. 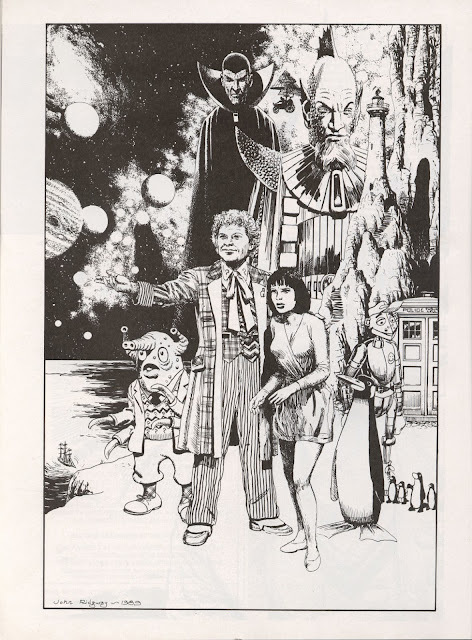 Then current (but not for long) current Doc Colin Baker appeared on the cover and in a strip inside. Unfortunately, Oink's unusual page dimensions mean that I couldn't scan any of the interior pages without chopping-off some of the page. Doh. 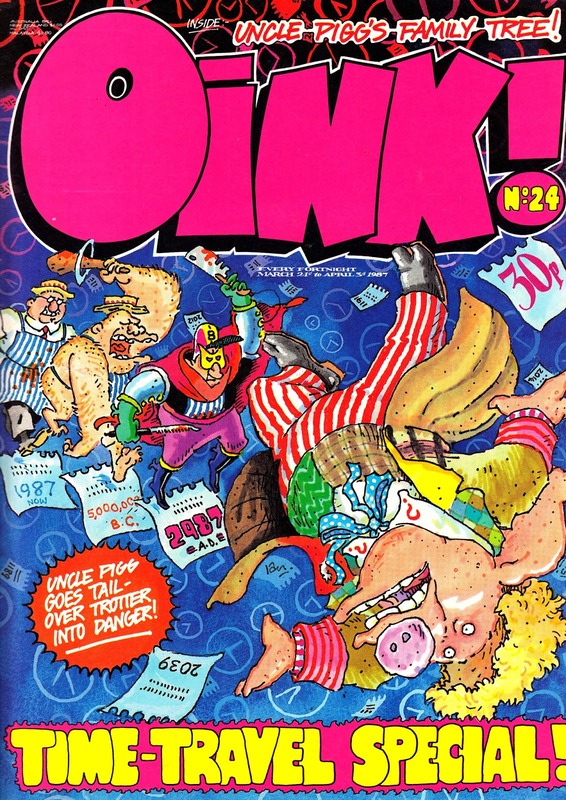 Oink ultimately ran until October 1988 (becoming the latest of a long stream of titles to end their days in the pages of BUSTER), clocking-up 68 regular issues and various spin-offs and annuals. Even a computer game. Why did it fail: perhaps the novelty wore off. Almost certainly, it was more expensive to produce thanks to its superior format and high origination costs. 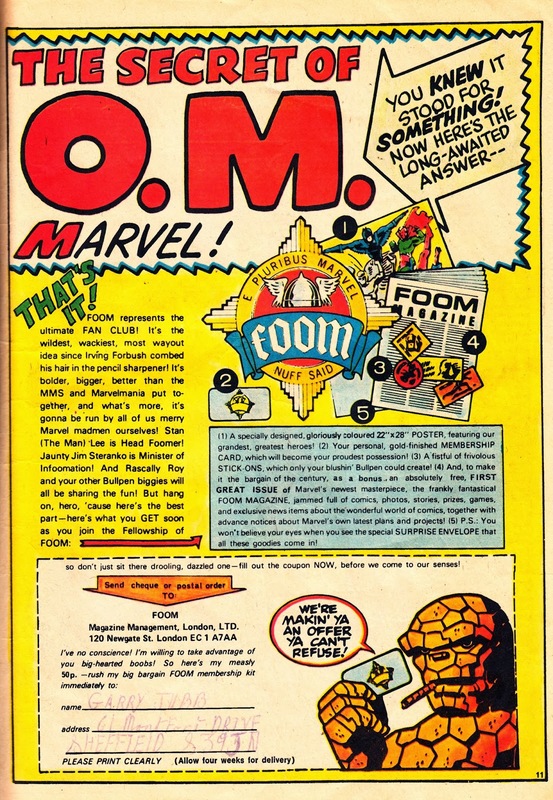 But - ultimately - it probably succumbed to the same nose-diving sales that was decimating the whole British comics business during the 1980s. I saw THE DAY OF THE DOCTOR on the big screen and I'm very glad I made the effort. It looked spectacular in 3D and stood-up very well against any reasonably budgeted feature film. The cinema-exclusive introductions were also great fun and a nice "value added" touch for fans who'd paid the going rate (some £15-odd in London) to see it. I hadn't really planned it like that but I also saw it at the cinema just across the road from BBC TELEVISION CENTRE which, for me, will always be the spiritual home of the show (sorry Cardiff!). THE FIVE(ISH) DOCTORS, courtesy of writer/ director/ star (and MY Doctor) Peter Davison was a lovely little bonus feature which was a real joy to watch. It's packed full of brilliant cameos and cheeky moments which will tickle the cockles of any fan. Anyone who's not tracked this spoof documentary down on the iPlayer or BBC Red Button service should do so now. I saw AN ADVENTURE IN TIME AND SPACE last night and really enjoyed it as well. I thought the storytelling and attention to detail (allowing for artistic license) was top-notch. It was lovely, and also bittersweet, to see BBC Television Centre on screen one last time. And Barnes Common was a nice nod to the Dalek Target novelisation. Hurrah. Here it is, the second launch from mighty MARVEL UK: SPIDER-MAN COMICS WEEKLY from February 1973. 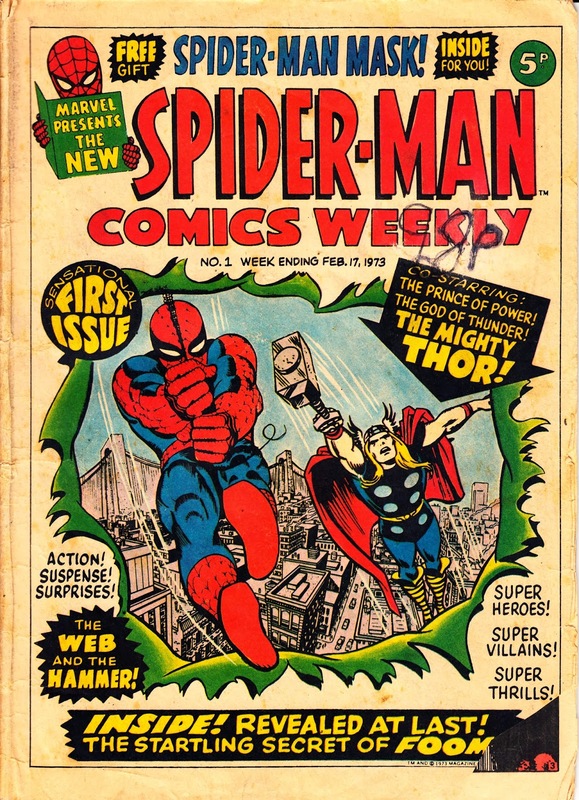 Spidey had, of course, been part of the inaugural line-up of THE MIGHTY WORLD OF MARVEL, launched a few months earlier but it didn't take long for him to graduate to his own weekly. The strip picked-up where MWOM (after 19 issues) left off with a reprint from US AMAZING SPIDER-MAN issue 9. 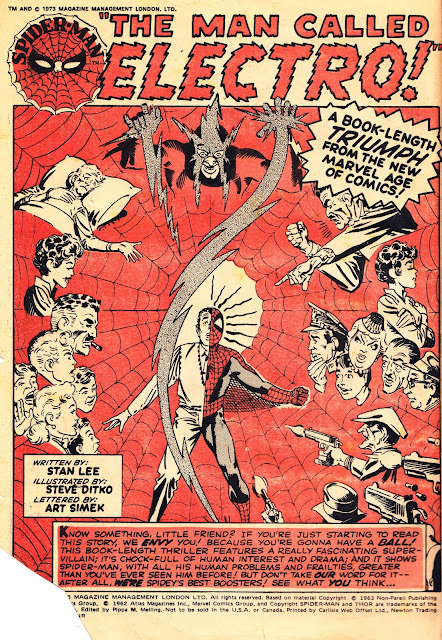 Spidey's slot in the Marvel anthology was taken, sensibly enough, by Daredevil (from issue 20) as the House Ad below shows. The long-running back-up strip was Thor, beginning with his first solo appearance from US JOURNEY INTO MYSTERY issue 83. 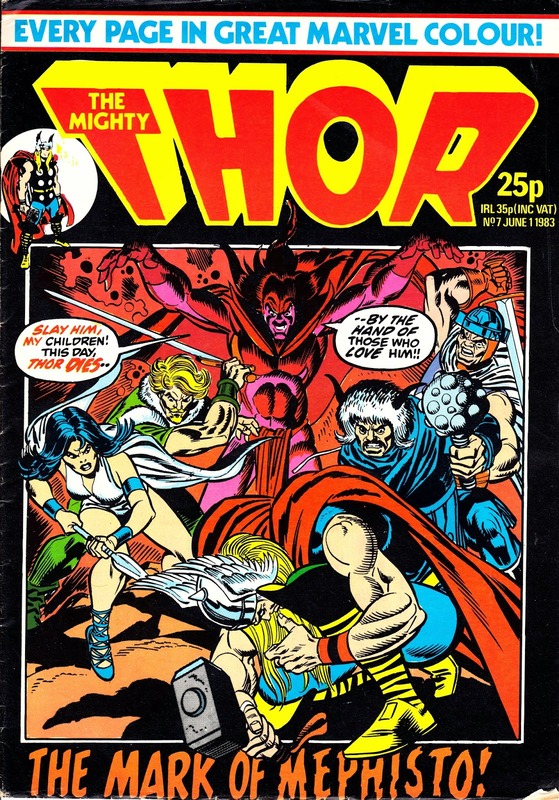 The Thunder God would bounce around the Marvel UK line-up for another decade before, finally, graduating to his own (short-lived) weekly. Stan also invited Brits to sign-up for Marvel's fan club: F.O.O.M (Friends Of Ol' Marvel) for a mere 50p. Membership included a subscription to the club's newsletter but British readers soon noticed a lack of coverage from the British Bullpen and a regular column was added to the line-up. The Web Head already had a track record in the UK predating the opening of the Annex of Ideas: he'd been part of the POW! 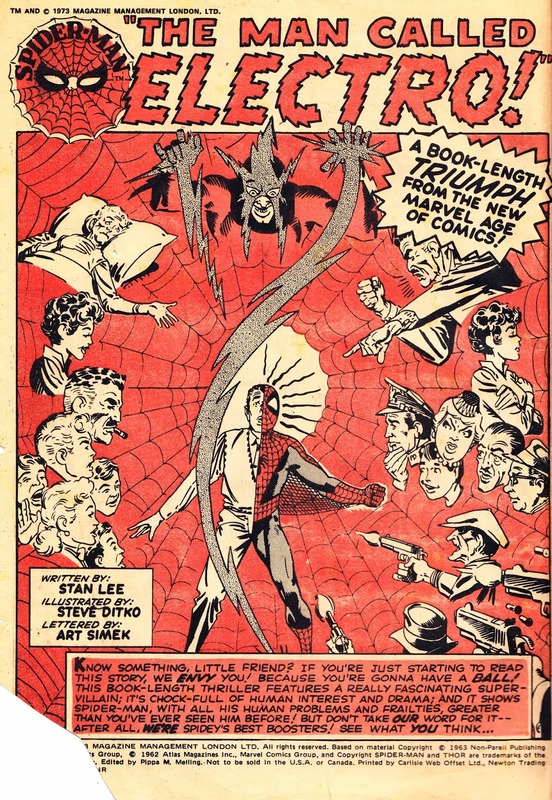 line-up from 1967 before being squeezed out as the Power Comics line condensed down from a peak of four titles. 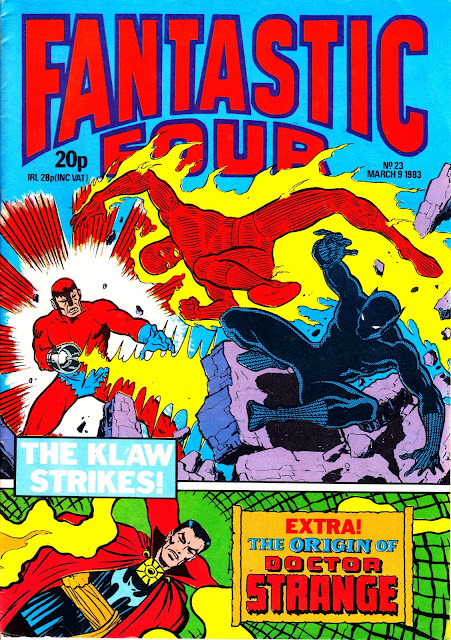 Long-time British readers would have found many of the early British Marvel adventures rather familiar as the weeklies covered a lot of familiar ground. 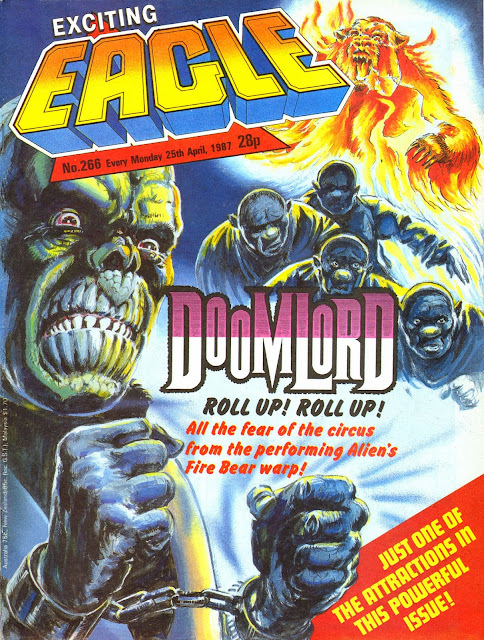 The launch proved a canny one: although it went through a number of name changes (and even more format swicheroos), the weekly clocked-up a highly respectable 666 issues (through to December 1985) before succumbing to patchy distribution, falling sales, a declining market and a disastrous relaunch. It returned, for another year, as SPIDER-MAN AND ZOIDS, a few months later. 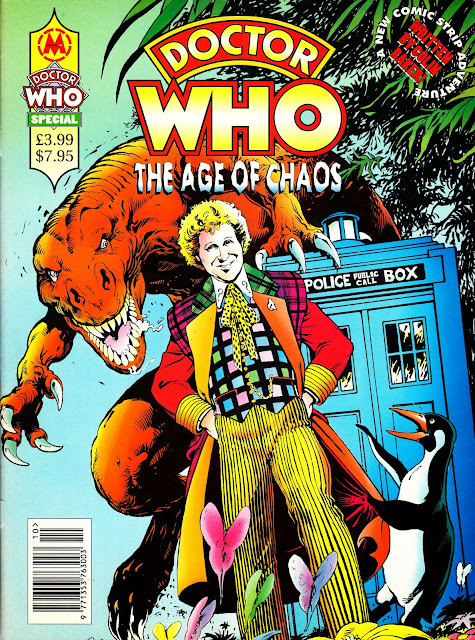 DOCTOR WHO: AGE OF CHAOS was one of the few former GENESIS 92 projects to survive the implosion. 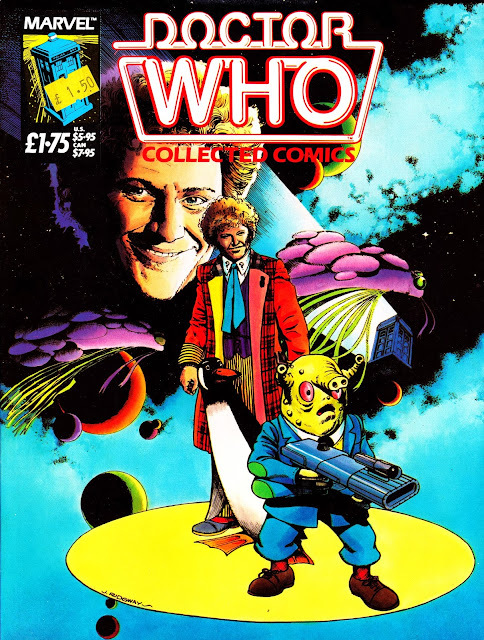 Published as a magazine format one-shot (some sources incorrectly describe it as graphic novel) in 1994, it ran the Colin Baker-scripted strip which had originally been planned as part of the US line. 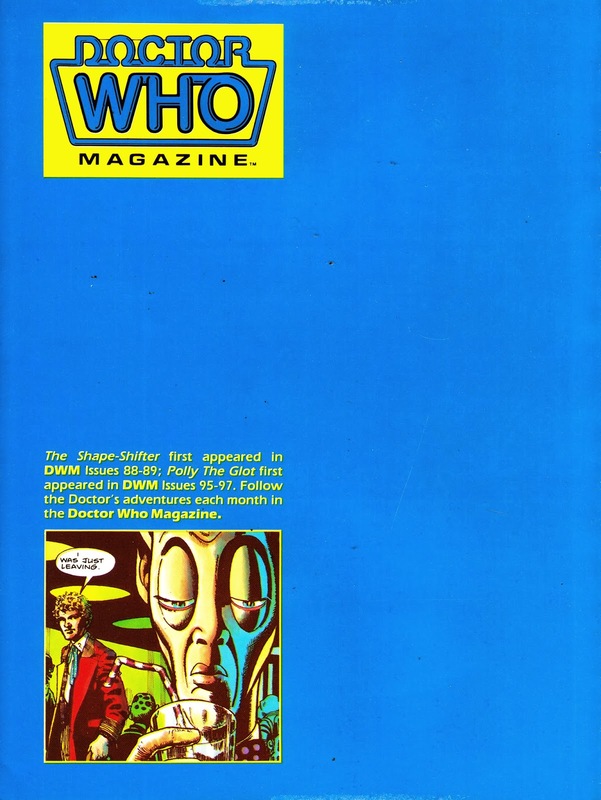 The four-part limited series, which would have been the first original WHO strips for US comics since the sixties DOCTOR WHO AND THE DALEKS movie adaptation one-shot, had been put on hiatus, and subsequently cancelled, when the G92 line started to run into trouble in late 1993. The four chapters were reworked here into one continuous story, removing the chapter breaks by tweaking the artwork. This hefty colour staple-strainer wasn't widely distributed at the time (WHO had been off-screen for several years and Colin Baker's sixth Doctor for almost a decade) and is fairly hard-to-find now. To date, it's never been reprinted. 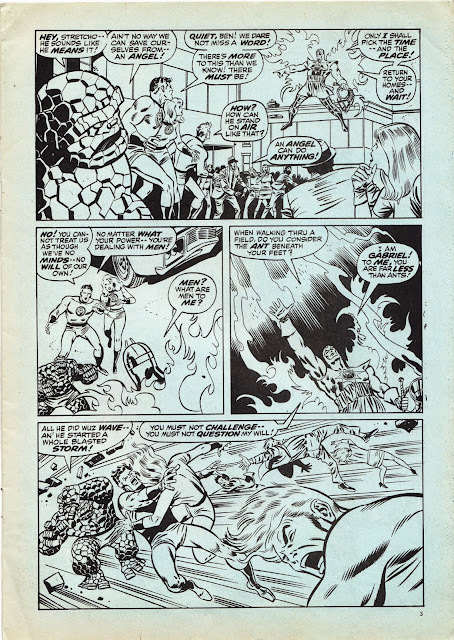 The cover, by Alan Davis, was originally planned for the first issue and used in the PR for the limited series. This EVENING'S EMPIRE one-shot, published in the autumn of 1993, was the one-and-only spin-off from MARVEL UK's DOCTOR WHO CLASSIC COMICS and, as far as I know, represents the only outing of the strip to date. And it's really rather good. Andrew Cartmel was, of course, the original series last Script Editor and turned his hand to penning some of the Doctor's strip adventures the following decade. Evening's Empire was originally scheduled for a regular run in the Magazine but only the first instalment appeared before production delays derailed the whole venture. Ultimately, that proved a blessing as Marvel pushed the boat out with this compilation: a striking new cover and colouring the originally black & white pages for the one-shot. It repeated the first instalment followed by the hitherto unseen subsequent chapters. Classic Comics, which I'm yet to cover, was a nineties four-weekly which ran strips from throughout the show's history, in colour for the first time (because WH Smith refused to stock a black & white comic rather than any particular altruism on Marvel's part). 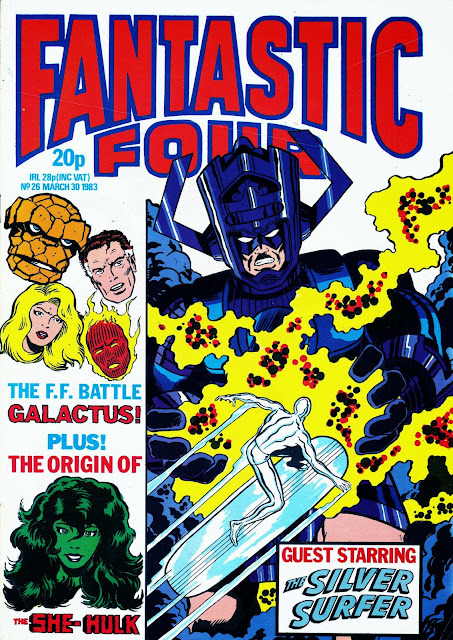 It's such an obvious idea but, surprisingly, no-one else has ever done anything with the pre-Marvel back catalogue. The other 50th anniversary this weekend is, of course, a certain Time Lord so I'm posting several related STARLOGGED era items to mark the occasion. 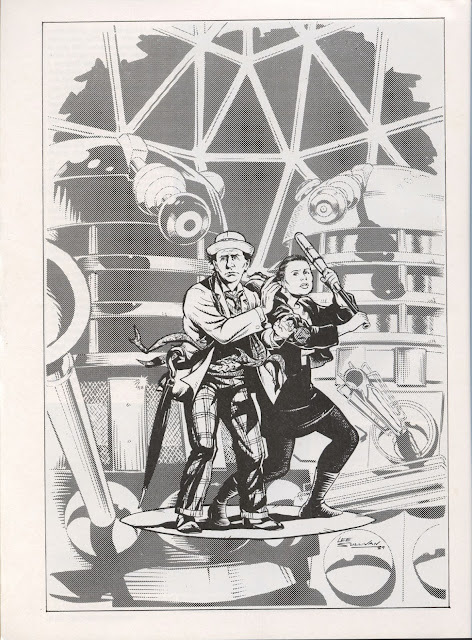 This DOCTOR WHO COLLECTED COMICS one-shot is a bit of an oddity. It looks and feels like it wants to be treated as a book (there's none of the usual advertising) rather than the latest in the run of MARVEL UK WHO specials. 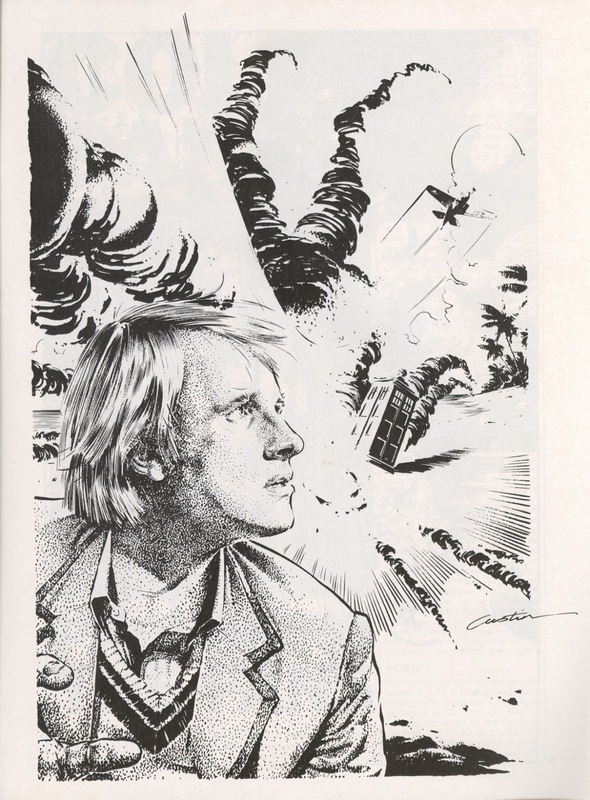 It was published in the summer of 1986 (filling the Summer Special slot in the publishing schedule) although its undated. The reprints hail from the Colin Baker run and were - presumably - assembled so that Marvel could maximise the return on their investment before his forced on-screen regeneration into Sylvester McCoy later in the year. The strips themselves are presented, rather nicely, in colour and the package is really rather nice. 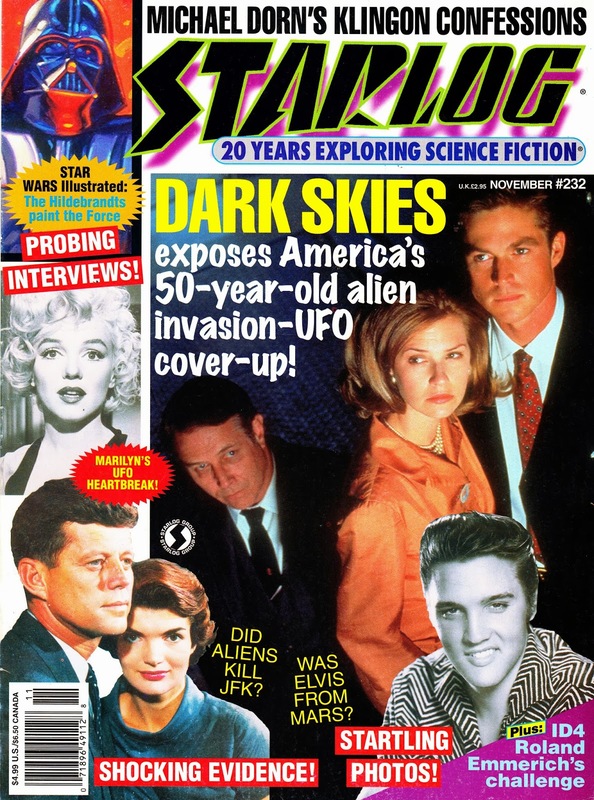 More JFK-SF-conspiracy shenanigans: this time the deliberately tabloid (and rather nicely done) cover of STARLOG MAGAZINE (cover-dated November 1996), pegged to the launch of NBC's ultimately short-lived DARK SKIES. Confession time: I liked (and still like) this show a lot. Sure, it was obviously made - ahem - possible by Mulder and Scully and often wasn't quite as well executed but it seemed better thought through than Chris Carter's sprawling epic and the "history as we know it is a lie" hook really appealed to the geeky historian side of me. 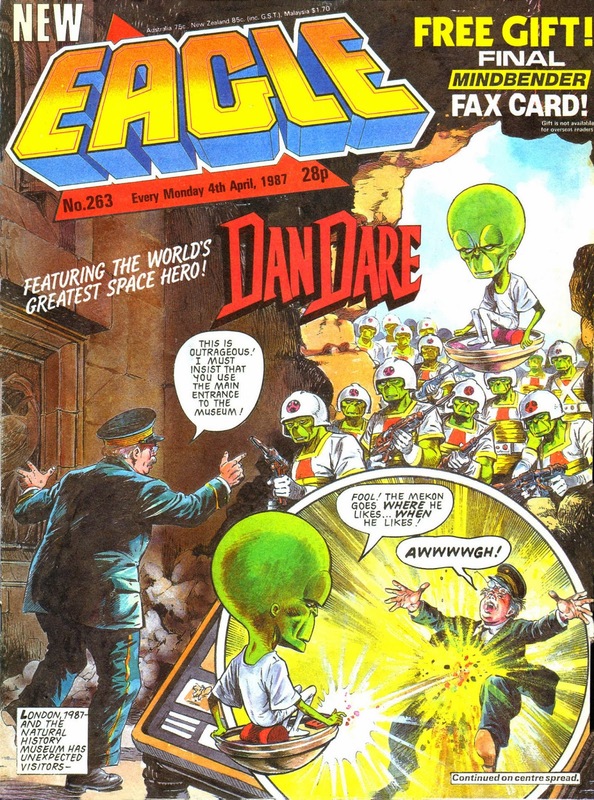 The, admittedly improbable, conceit of the show was that pretty much ever significant event in post-WWII history was somehow connected to a covert alien invasion plan and the attempts by the top secret Majestic 12 organisation to, using all means necessary, to keep it in check. It was a bonkers premise which frequently strained (or snapped) credibility but, at its core, was a really neat idea. 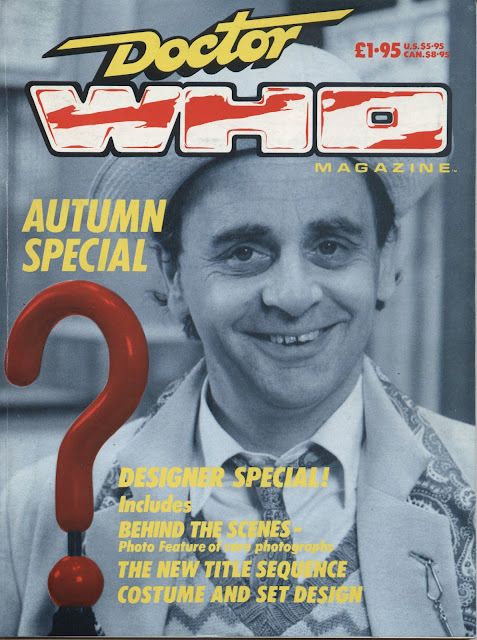 The show's first (and only) season spanned the sixties but the master plan was that each subsequent season would have covered subsequent decades until the show came right up to date with the millennium. It would have been awesome. The critics were, not unsurprisingly, pretty harsh and most dismissed it as another in the succession of FILES knock-offs that cluttered the mid-nineties schedules (heck, even BAYWATCH NIGHTS went supernatural in its seldom-seen second season) but I think they were a little too quick to dismiss a show that had the power to get you thinking a bit. The ratings were never good so the producers were - ahem - encouraged to make some mid-season course changes (notably adding Jeri Ryan, as a Russian Mrs Peel) to the existing ensemble but these, for the most part, did lift the show by challenging the viewer's perceptions of the format and suggesting that no one was safe from the unfolding battle with the alien Hive. Eric Close managed to shrug off the failure and carve out quite a small screen career, most recently on the far-better-than-it-should-be NASHVILLE. By all means seek out the DVD box set. Once dismissed as being 'unreleasable', because of the copious amounts of expensive-to-clear period music, the show has now been released on R1 and R2. If you have the choice, plump for R1 as it has a much better set of really rather good extras. The show deserves no less. Today is the 50th anniversary of the Dallas assassination of President JFK so, to mark the occasion, I've unearthed two themed items from the vault. This is 2000AD prog. 1070, cover-dated 25 November 1997 (so, technically, a year-or-so outside the usual scope of STARLOGGED). 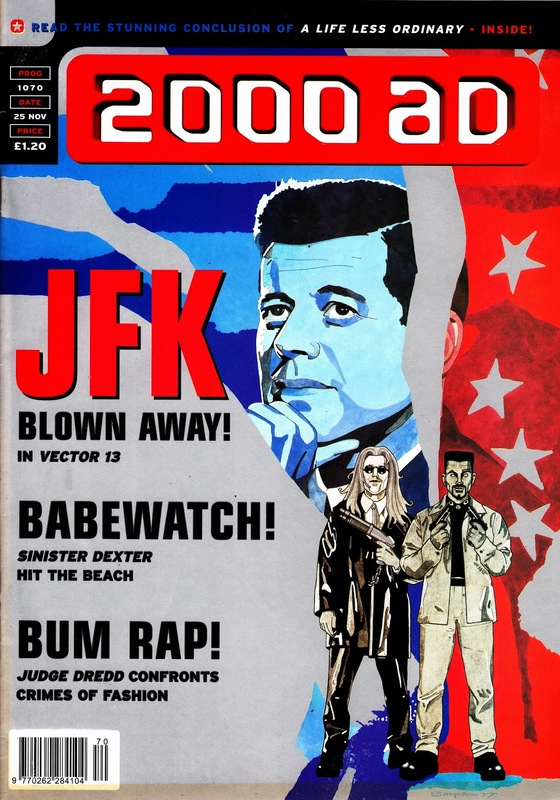 The cover relates to a Vector 13 short, by Abnett (him again) and Brand, set in Dallas that fateful day. 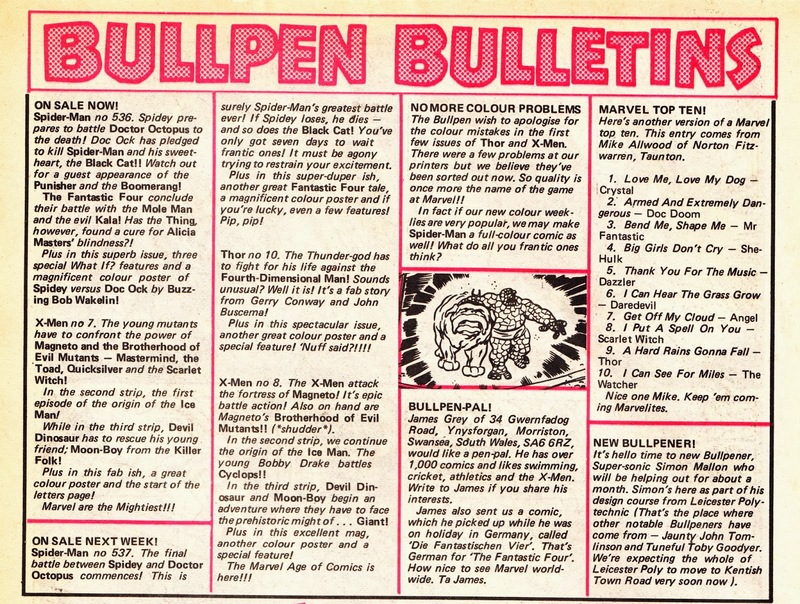 Vector 13 was the successor to the twist-in-the-tale shorts (Tharg's Future Shocks and Time Twisters) that had long been a page-filling mainstay of the venerable weekly. This being the era of THE X-FILES, V13 had a men in black/ conspiracy vibe running throughout and - for a while - the strip's host replaced the Mighty One himself as the weekly's figurehead editor. As far as I know, none of the V13 run has ever been collected and reprinted which is a shame... as I'd certainly snap up a volume if they did. This eye-catching landscape MYS-TECH WARS House Ad appeared in MARVEL UK Genesis 92 books cover-dated March 1993. New format. New Doctor. New logo. The DOCTOR WHO AUTUMN SPECIAL 1987 went on sale just as the TV show returned to the BBC ONE schedules. My memory is a little fuzzy but I believe this went on sale a few days before the show returned (or, possibly, on the day it aired) as I remember this was my first sighting of the new (and much unloved) logo. This was the first of several specials that used the square bound album format, an evolution of the design Marvel UK had been using for several years, to create a more classy package. There was, once again, no comic strip. 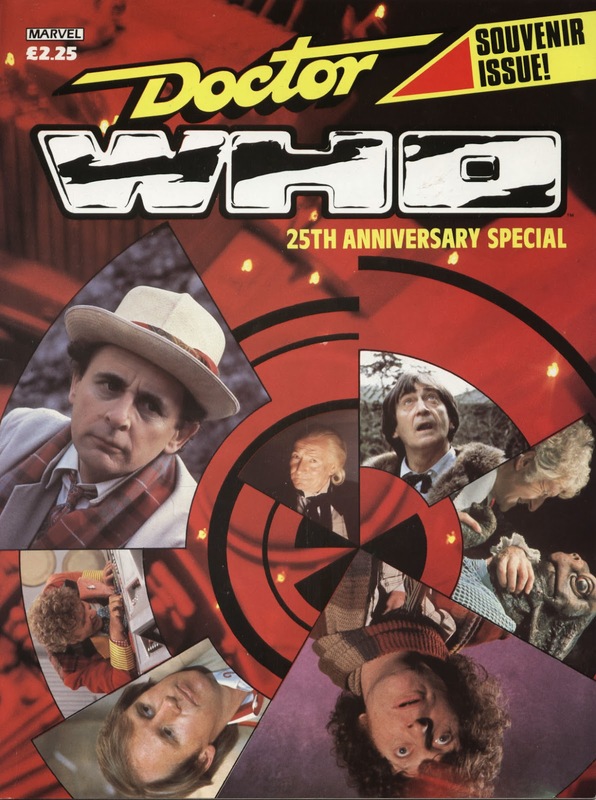 The running theme was the show's behind-the-scenes design work including an overview, a piece on the McCoy era title sequence, sixties design and directing and costume design (June Hudson, including some nice behind-the-scenes reference polaroids). 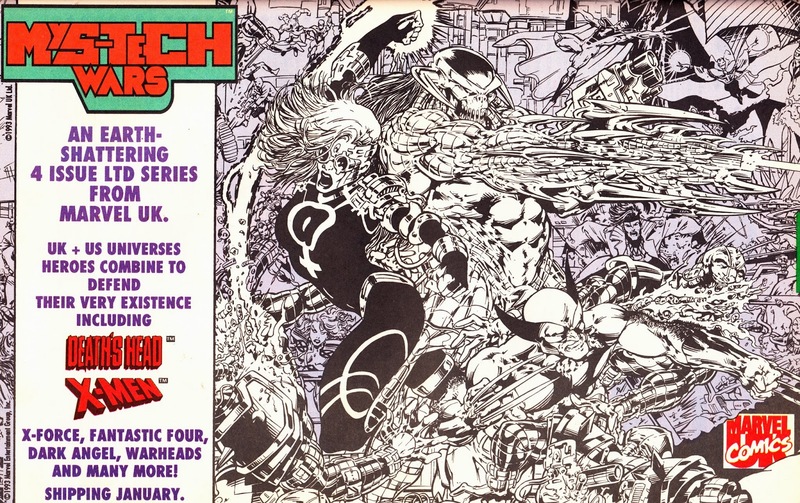 MYS-TECH WARS was another of MARVEL UK's blockbuster mini-series which followed the familiar formula of chucking in as many bankable characters as possible and letting them scrap for a few issues. The four-parter, which sold great guns, appeared just as the Genesis 92 Explosion (cover dates spanning March - June 1993) was really taking hold. The ubiquitous Dan Abnett supplied the storyline alongside Bryan Hitch's impressive art (including a run of really striking wrap around covers). There's never been a reprint so, as with all the Genesis 92 books, the 50p back issue box is your best bet. 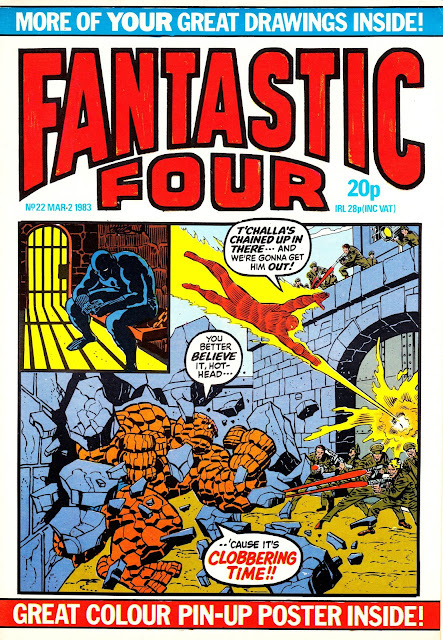 March 1983 was a five cover month for MARVEL UK's FANTASTIC FOUR weekly which, once again, continued to mix imported and original cover art fronting-up an all-reprint line-up. The rotating back-up slot continued to be filled with assorted origin stories with Doctor Strange and She-Hulk appearing this month. 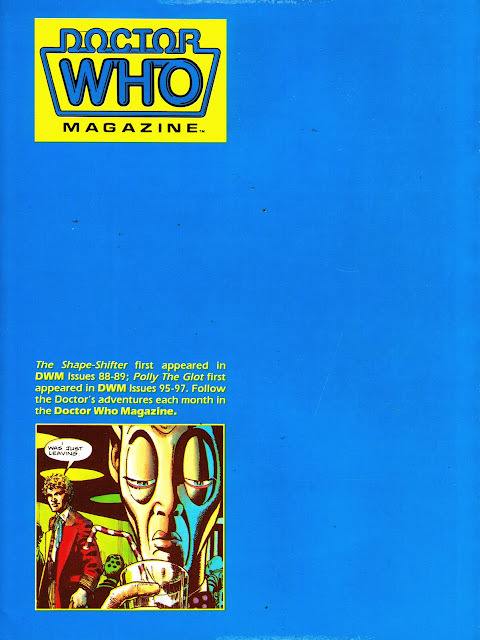 Issue 24's interior pages were, for reasons unknown, published on paper with a slight blue hue. I've scanned and posted one of those pages below. From the back cover of the DOCTOR WHO WINTER SPECIAL 1986: an advert for DOCTOR WHO MODEL KITS, manufactured by Sevans. 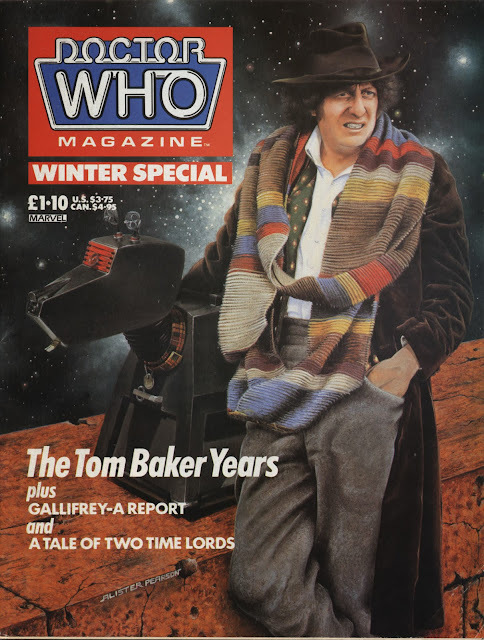 The 1986 DOCTOR WHO WINTER SPECIAL, from MARVEL UK, turned back the clock to the Tom Baker era. Lurking behind the Alistair Pearson cover was an overview of the TB era, The Talons of Weng Chiang in the Archive feature, an interview with Chris Boucher, a background piece on Gallifrey and - more tenuously - a joint interview with Lynda Bellingham and Michael Jayston from The Trial of a Time Lord starring - err - COLIN Baker. 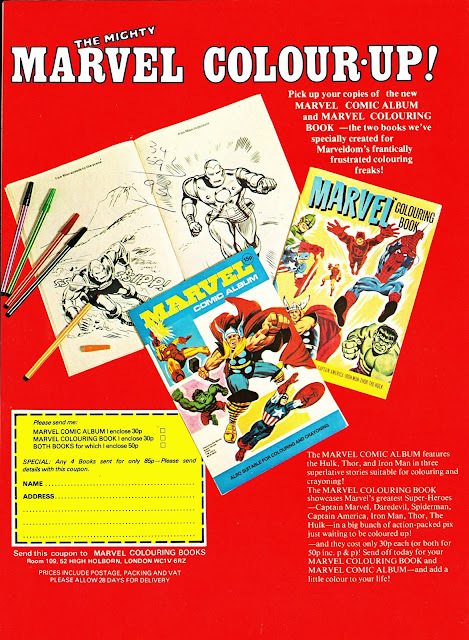 Another blast from the seventies: MARVEL COLOURING BOOKS, as plugged in the pages of MARVEL UK's weeklies. 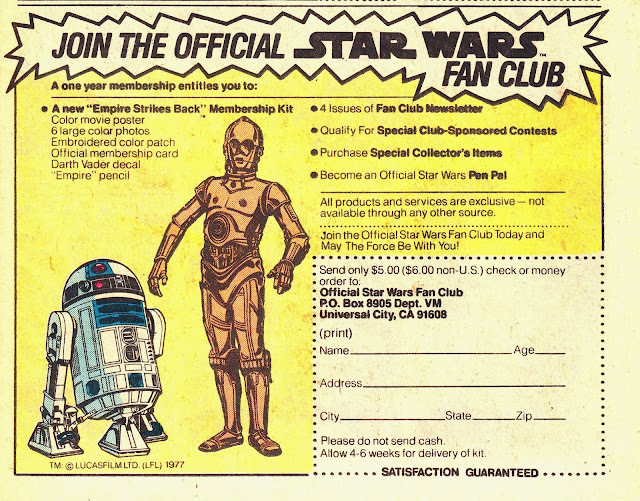 This ad appeared in March 1976.